Socialize Me: Working in the west coast is exhausting! Last week I went to Seattle to kick off an internal social software project. (Sorry, that's all you get. If you want more details, go to my internal blog) . I got there on Tuesday at 11:30pm PDT (2:30am EDT). The week was not off to a good start! 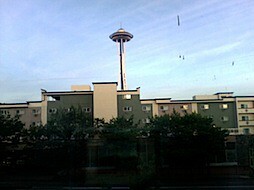 Nevertheless, I was lucky enough to have a view of the Space Needle from my hotel room. I actually took this picture with my MacBook Pro's camera. You must know that I'm very disappointed that my BlackBerry 8830 doesn't have a camera!!! Anyway, I had all day meetings Wednesday to Friday. Still, I signed up to do demos to my east coast customers early in the morning . (Hey, revenue is still important!) The problem ? The demos were scheduled from 8am - 10am EDT (5-7am EDT). That meant that I had to wake up every day ~4:30am PDT. The meetings at the IBM office went all the way through 6:30pm PDT (9:30pm EDT). Therefore, I was having 17 hr work days!!! And that doesn't count the time I spent back at the hotel catching up on those emails that accumulated throughout the day. After I left the office on Friday, I hooked up with one of my friends from middle school who now works for Microsoft. We hung out for a couple of hours and then he dropped me off at the airport. I took the red eye, Seattle to San Francisco. While waiting at San Francisco there was a 4.1 earthquake reported at the airport, but I didn't feel it. From there, I flew to Philadelphia, and then finally to Puerto Rico, arriving at 11:30am! To say the least, it was a very long week. Now I'm off to blog more about the project in my internal blog.